“Ace in the Hole” – This term is used more as an expression than an actual poker term. In everyday life, having an ace in the hole means someone has a secret that will sway the advantage to their side. And in poker, the term kind stays on that same path. In a game like Texas Hold’em, having an Ace in your two-card deal – or hole – is advantageous because the Ace is valued as the highest ranked card in the deck. “Big Blind” – No, were not talking about a chubby guy with cataracts. When playing poker with a group, there are two forced bets before every hand. The size of the blind has to do with the players’ proximity to the dealer. The player to the immediate left of the assigned dealer is tagged the small blind, who makes a wager predetermined to the deal. As an example, the small blind may be $5. The big blind is often the player to the left of the small blind, and is required to make twice the bet as the small blind. So in our example, that would make the big blind $10. 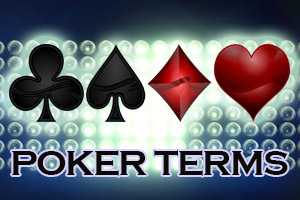 “Cooler” – Being cold is usually never a good thing, and poker is no different. A cooler is the second highest graded poker hand at the table, which also means – more often than not – it’s a losing hand. A player holding a cooler can think they have a strong hand, bet aggressively and try to cash in, but ultimately ends up getting beaten for a big loss.